Lucky to be on Team Green! 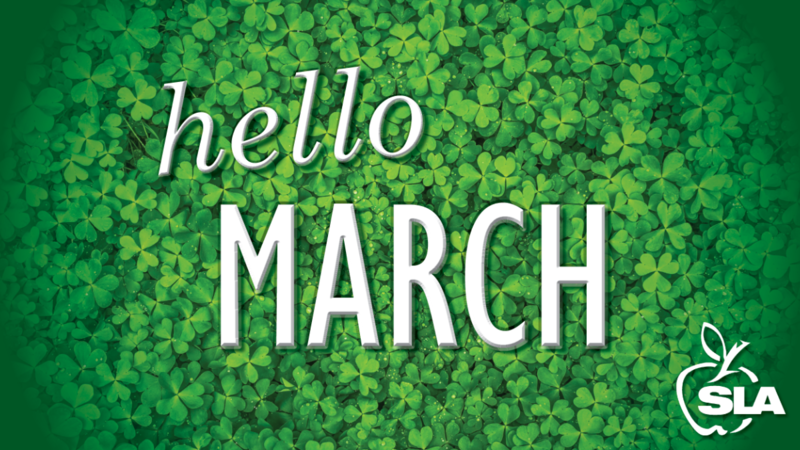 With St. Patrick’s Day this month, the color green will be a popular color you see in stores and on clothes. At SLA, we love the color green because it reminds us of our commitment to helping the environment. In the past year alone, we have made two major changes that support our “going green” initiative. First, we have switched to environmentally friendly serving containers, meaning all our lunch trays are compostable. Second, we switched to all-green, environmentally friendly cleaning solutions in all of our kitchens. Both of these changes will help us provide a brighter, greener future for the students we love to serve. We certainly feel lucky having the opportunity to provide healthier, greener meals in all of our SLA Cafés! 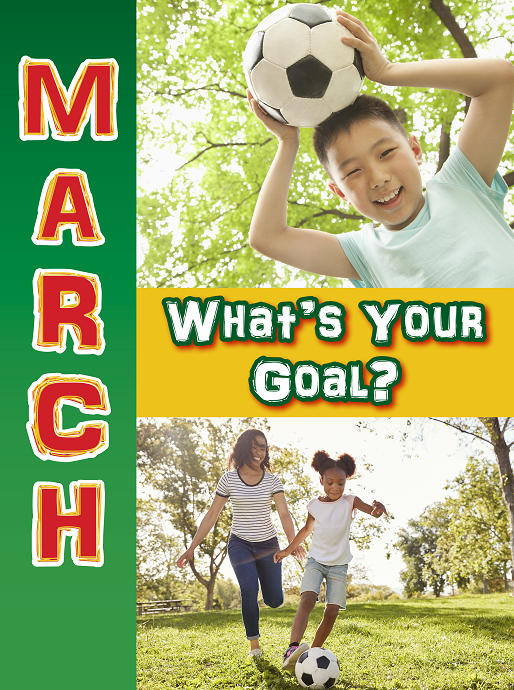 Every March, SLA celebrates National Nutrition Month® to promote healthy eating habits among our students and communities. With the hustle and bustle of everyday life, it can be difficult to make time to educate ourselves on proper nutrition and wellness. That’s why it’s so important for us to use National Nutrition Month® as an opportunity to reflect on our current eating habits and find new ways to improve our overall health and well-being. 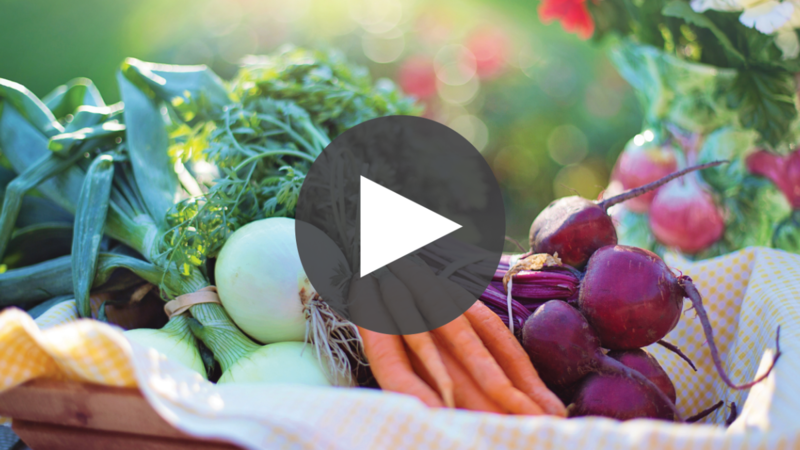 To get you started on your “nutrition-rich” journey, here is a quick video about eating right for your lifestyle. Enjoy! National Nutrition Month® is brought to us by the Academy of Nutrition and Dietetics. Visit their website at https://www.eatright.org for more videos, activities and information about nutrition. Reach out to your SLA Café Manager to find out which promotions are being featured at your school this month! 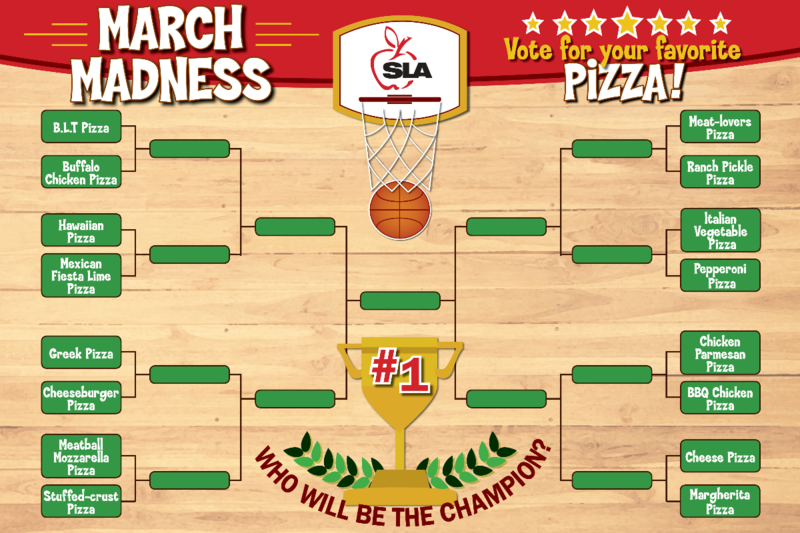 SLA is excited to be holding it's very own March Madness Tournament! All month long, students will vote for their favorite pizza options. Each week, the brackets will get narrowed down until the final pizza is determined, crowned Champion, and served at lunch in the last week! 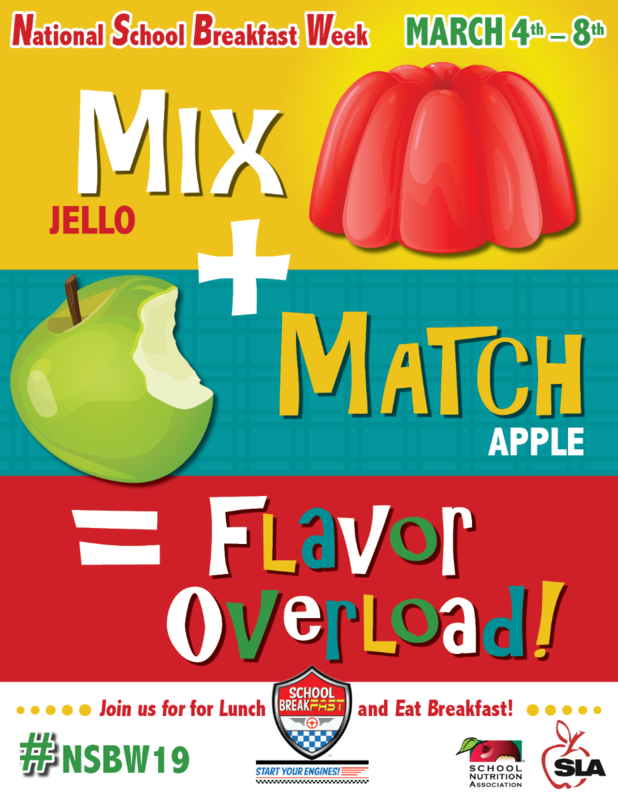 Wrapping up this week, in recognition of the important part fruit plays in a healthy breakfast, we will be introducing a fun and zingy way to include apples with breakfast. You know what they say... "An apple a day keeps the doctor away!" To find out more information about National School Breakfast Week visit http://schoolnutrition.org. These days, St. Patrick’s Day has become a cultural celebration of all things Irish. Since it falls on a Sunday this year, your café will celebrate on a school day close-by. 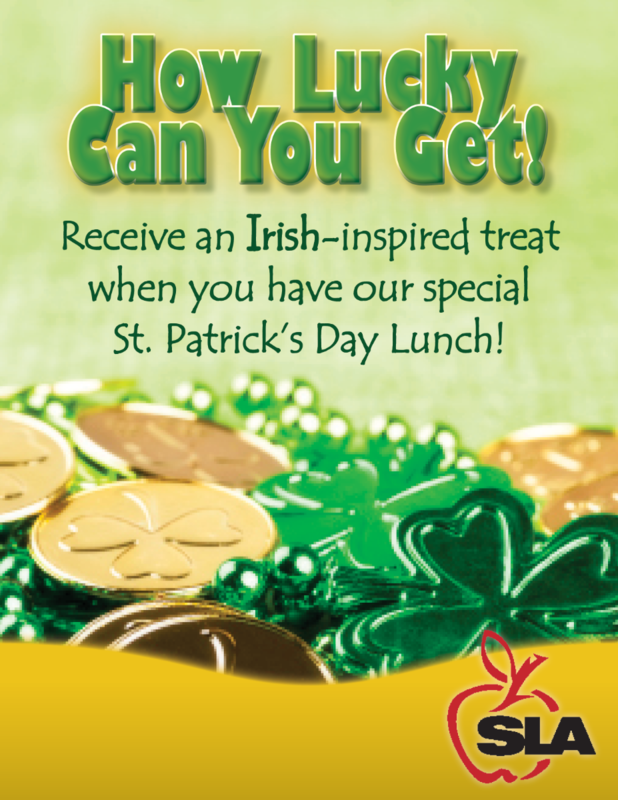 Students will receive an Irish-inspired treat with their meal at lunch. The Outdoor Activity of the Month is up on the SLA Facebook page. Click on the picture to link directly to it! Manage your student’s lunch account, and more, on your mobile device. What fresh and locally available produce have our Chefs used to create this month's super tasty recipes? Check your Café Hub® to find out!